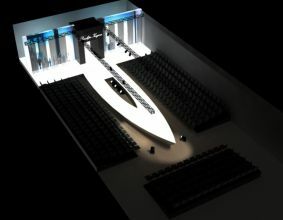 The project concerns the stage design of the fashion show space (coming on the stage and the catwalk from the dressing-rooms). On either side of the entrance led walls in the form of vertical bands are placed, which function as transparent curtains on which live material from the show is projected. Morphologically, the design of the catwalk keeps the form of the conventional type, with a “cicatrice” in the centre, that delimits the double and opposite movement of the models. The curviform of the head supplements the summer atmosphere of the collection creating the setting of a yacht.